When I saw Grindhouse earlier in the year I was absolutely convinced that I would not see a better film all year. Hot Fuzz sorely tries that assertion. My favorite types of parodies are ones that are so accurate to the source material that they're trying to parody that they actually blur the line and become to some extent what they are parodying. They become so funny because they are so absolutely accurate. 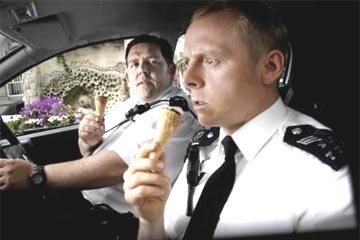 Hot Fuzz does this to a T. It is actually a parody of two different genres of movies: British police procedural dramas and stupid American cop action flicks. But like Edgar Wright's zombie parody Shaun of the Dead, Hot Fuzz moves beyond just being a parody (or an accurate portrayal of the type of movies it's parodying) and becomes an honest-to-goodness good movie. Simon Pegg (also of Shaun) plays Sgt. Nick Angel, one of those workaholic cops whose only raison d'etre is his job. He's so good at his job, in fact, that he's making all of the other London cops look horrible by comparison. Their solution? Have him transferred out, of course. So Angel gets transferred (against his will) to a sleepy village out in the country, and is partnered with a dim-witted but good-natured, rolypoly, American-cop-movie-obsessed bumpkin (and son of the local head of police) Danny Butterman (Nick Frost, also of Shaun). At first Angel is absolutely a fish out of water in this laid-back place, but soon a strange sequence of coincidental accidents besets the town. Are they more than coincidental? Or are Angel's big-city cop senses over-analyzing things? Under Wright and Pegg's screenplay, Angel and Butterman quickly become surprisingly three-dimensional characters about whom we come to care a great deal. The plot is a genuine (if purposefully by-the-book) mystery. There are exciting twists and turns as there would be in any good British police procedural. The whole movie becomes so involving that it builds and builds towards its inevitable and highly satisfying third act. The movie that in a weird way most closely resembles Hot Fuzz is Spike Jonez's brilliant Adaptation, which also careens off in another (similar) direction in its final act. So well done is this final act that there was one moment that practically got the entire theater to stand up and cheer. It was spectacular. Hot Fuzz succeeds on yet another level: Not only is it a pitch-perfect parody, not only is it an actual good movie with involving story and characters, but it is flat out and absolutely hilarious from beginning to (especially) end, without sacrificing any of the emotional core of the characters and their relationships. It is a marvelous balancing act that perhaps even exceeds Shaun of the Dead. We'll have to see come end of the year whether Hot Fuzz or Grindhouse will be my favorite movie of 2007 (I'll own both movies on DVD by then and will have watched them probably many times, so I'll better be able to decide). Right now they're practically neck-and-neck, with Grindhouse having a slight edge just due to the sheer moviegoing experience it provided. If by some miracle another movie comes out in 2007 that I like even better than either of these movies, this will be the best year for movies in a long, long, long, long time. But I ain't holdin' my breath.